K&S Aluminium Tube 7/32 x 12". Suitable for a wide range of uses. Item Name: K&S Aluminium Tube 7/32 x 12"
K&S Aluminium Tube 1/4" x 12" (6.35 x 305mm). Suitalbe for a wide range of uses. 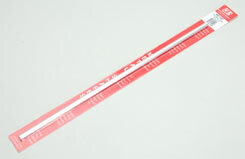 Item Name: K&S Aluminium Tube 1/4" x 12"